When was the last time you saw an elephant on a surfboard? Or made teeth with your bare hands? If you don’t know the answers to these questions, you must have missed April Free First Saturday. Here’s what happened on that zany day of fun. 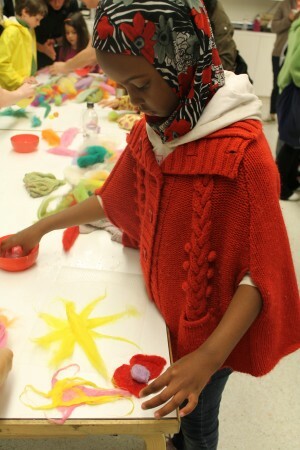 The Textile Center created a dazzling hanging garden in the Star Tribune Foundation Art Lab. Kids rolled, smushed, and played with wool fibers and soapy water to make leaves, flowers, bugs, and rocks out of felt. 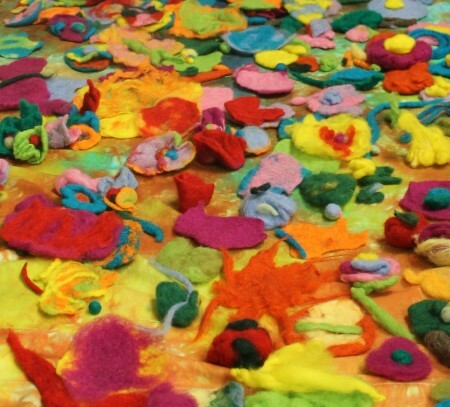 The colorful creations were sewn into a garden on a tie-dyed cloth that will be on display at the Textile center this fall. 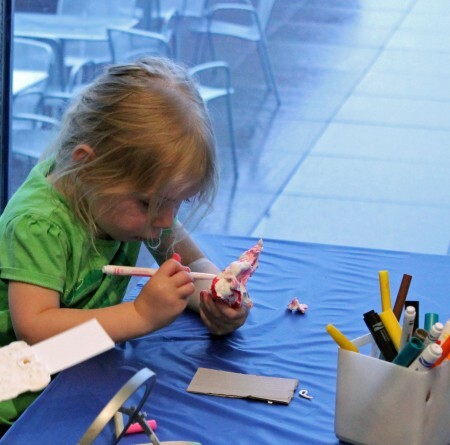 In Gallery 8, families showed off–and created–their toothy grins. Using modeling clay, paper, and markers, kids made replicas of their teeth and recalled memories of front teeth, cuspids, and molars. Children also made big gaping jaws that could open and close! Then they read Chris’s book Monkey with a Tool Belt and the Seaside Shenanigans. Kevin’s voices were so funny, Chris had to pause her storytelling because she was laughing too hard! Some kids asked why Chico the monkey had a gumball in his tool belt. Chris figured he could chew the gum and use the wad to plug up a hole in a pipe. “Don’t try that at home,” she said. “Only with supervision,” Kevin added mischievously. And of course, Kevin and Chris chatted with Walker visitors and signed books after the readings. 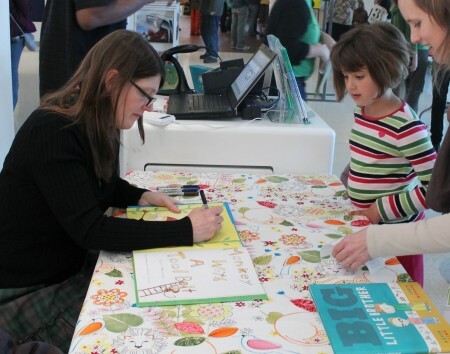 We encourage you to read these wonderful picture books, and also to come explore the ideas of reality and fiction at our next Free First Saturday on May 5!